Yesterday Nordex published its annual report, which was pretty pessimistic, at least for the time horizon till 2020. As a matter of fact: although more and more wind turbines are installed, the margins shrink. Anyway, the first market reaction was pretty positive and the stock jumped about +5%. However, it closed by -2%. 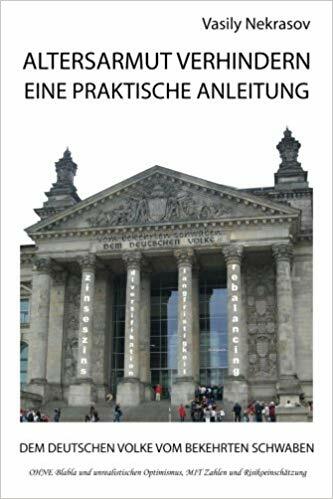 Morality: be patient and generally always wait until the end of day when you evaluate the reaction to the quarterly or annual reports. Today Nordex has continued falling (currently -12%). 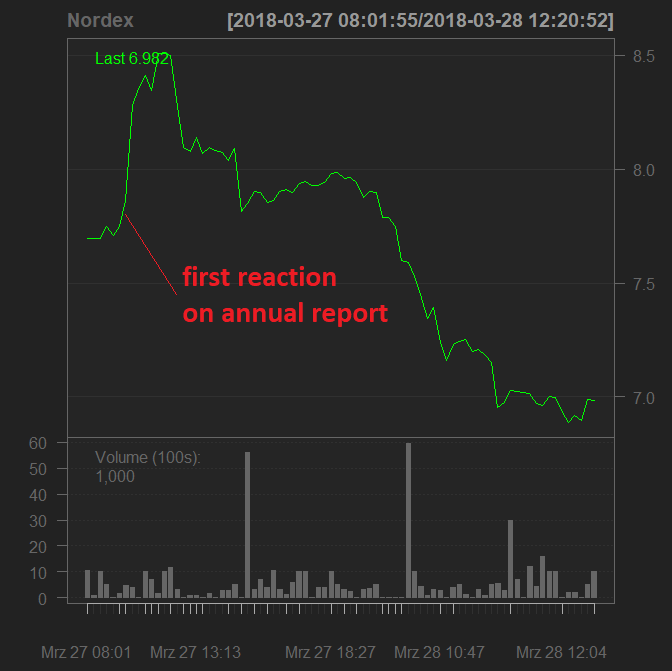 It is hard to determine the cause so far but likely it is a (repeated) bankruptcy of the peer company SolarWorld, which produces solar panels (both wind and solar energy belong to renewables, so it is correct to talk about peers). Such "peer-panic" is not uncommon, i.e. year ago I used it to buy RTL as the Pro7 stock fell down (both are media companies). 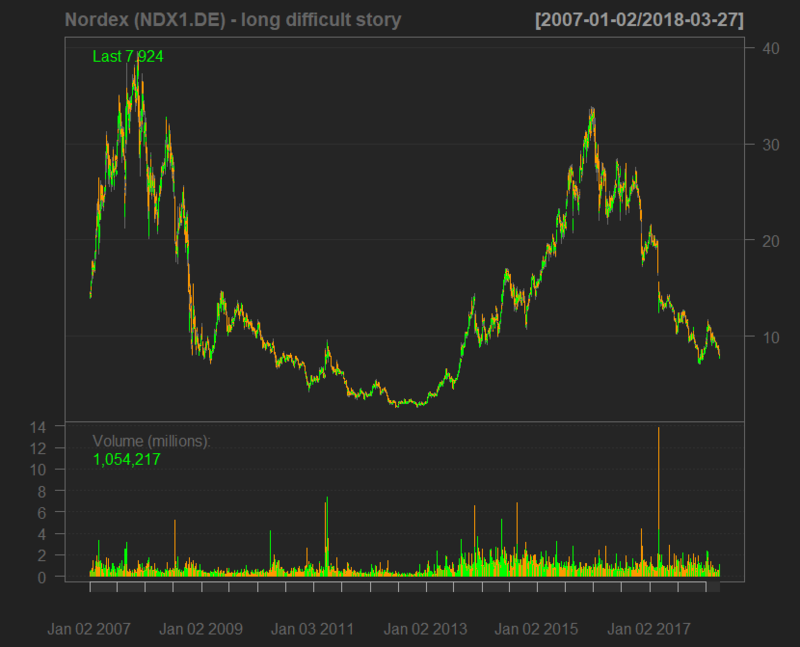 So it is a good opportunity to buy Nordex shares? I would not affirm this. First of all, a panic reaction the SolarWorld insolvency is, so far, just an assumption. Secondly, the near future of the turbine producer is expected to be turbulent. Thirdly, currently the whole market is nervous. 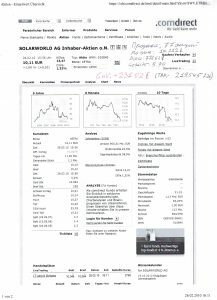 SolarWorld (repeated) bankruptcy is a good opportunity to share my memories from 2010. 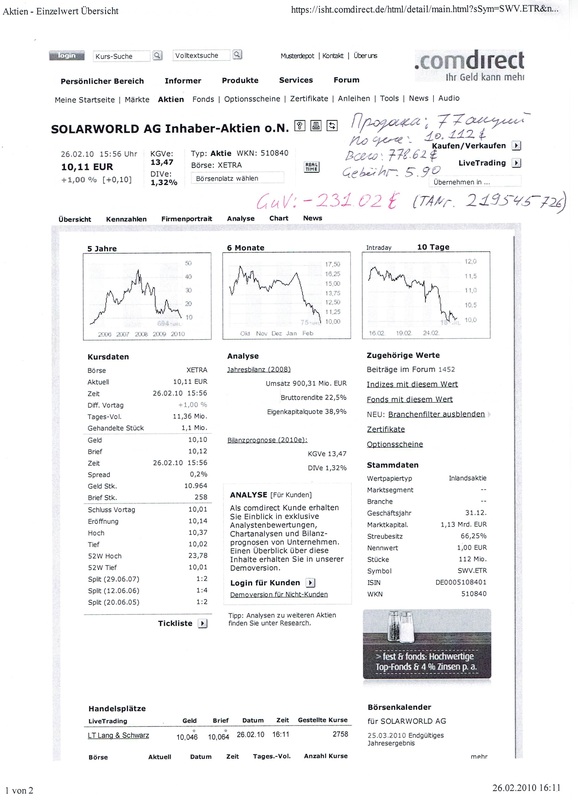 By that time invested some money in SolarWorld. It was not stupid, since both EBIT and P/E were good and also from charting point of view it seemed (by the time of purchase) that the stock started to recover. But I stayed disciplined and sold the stock as the position made a loss of -20%. And it was a right decision. You are welcome to discuss Nordex and other stocks in our forum. Disclaimer: Currently we have no position in Nordex and SolarWorld. Previous Previous post: Does Stock Picking Still Make Sense? Yes, it does!